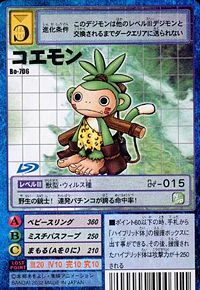 Difference between revisions of "Koemon"
A Beast Digimon that has the appearance of an infant monkey. It has enough strength to wield a slingshot the size of its body with ease, and confidence in its abilities to prevent its prey from escaping. It often falls from treetops due to its careless personality. Its stylish traits are its tiger-printed outfit and its white-tipped tail. Its Signature Move is throwing a hoop at the opponent's legs to ensnare them and cause them to fall over (Mischievous Hoop). Its Special Move is a shooting attack that boasts of infallible accuracy (Baby Sling). 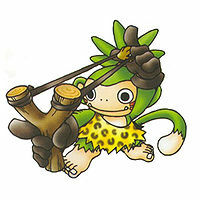 From a combination of ko 「子（コ）」 and etekou 「猿公（エテコウ）」, meaning a child personified monkey. 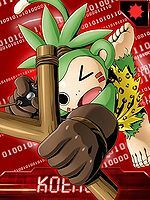 Anime/Manga Digimon Xros Wars: "Xros Sweets!! The Girls' Sweet Trap!?" Baby Sling  ベビースリング Bebī Suringu Fires a metal ball or other projectile from its slingshot with perfect accuracy. 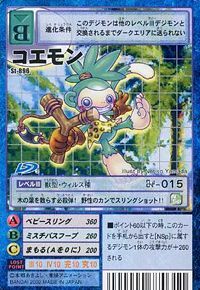 Mischievous Hoop  ミスチバスフープ Misuchibasu Hūpu Trips the enemy with a throwing wheel that entangles their leg. 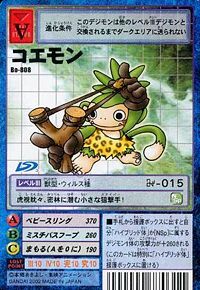 Koemon is an obtainable digimon. It can be obtained either by choosing the Powerful Pack at the beginning of the game, or by speaking to DRI Agent Yang at the Mobius Desert and obtaining the data from Assaultmon, who can be found at Duelist Island in Asuka Server. 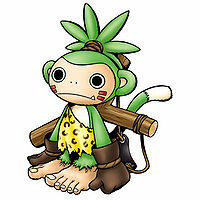 Appears as an NPC Digimon during Impmon's Onegai Quest. Gives you the Slingshot which Impmon wanted. 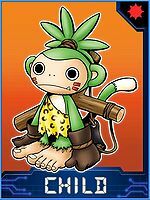 He is not obtainable and cannot be evolved from any Digimon. 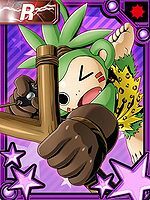 Koemon is available as a Digimon Medal. Its deadly bullets scatter leaves all over! It relies on its wild instincts as it fires its slingshot!! A wild gunslinger! It prides itself on its accuracy as it rapid-fires its slingshot! This small sniper watches keenly as it lies in wait within the jungle!